Overall a decent tent but a tight fit for two average-sized guys. Quality construction and excellent waterproofing. I've been a fan of Marmot products for several years thanks to quality products that hold up to a lot of use. The Marmot Limelight 2 is no exception — a quality tent for the right price. My partner and I have used my 3 season, 3 person ALPS tent until last year when I decided to make the switch to something smaller and lighter. After looking at a number of tents within my price range, I settled on the Limelight since it included a footprint and gear loft. Setup is a breeze and takes a single person 8-10 minutes to pitch and completely guyout. The stakes are high quality with a hexagonal design that helps prevent them from bending like a standard aluminum stake. The only issue was that on arrival, I was shorted one guyline. Ventilation in this tent is exceptional. We just got back from a trip in the High Uinta Wilderness where we were rained on daily and had overnight temperatures of about 40°F. We didn't experience a single drop of condensation and had 0 leaks with all the rain. Also, given the weather we were having, the window in the vestibule was a nice addition making it easy to decide whether or not to sleep in. There are a couple of drawbacks that are more of an inconvenience than a deal breaker. First, the tent is small for two average sized guys. I'm 5'9" and 170 lbs, and my partner is 5'8" and 180 lbs. We're a tight fit in the Limelight and having a single door and vestibule means one of us has to climb over the other when nature calls in the middle of the night. It's also not the lightest tent on the market, so if you're an ounce counter, go with something ultralight. Ending on a positive note, the reflective guyout points are a bonus and once you've got it all staked out, it stands up to substantial wind, rain and even snow. All in all, a high quality tent for a great price. I chose this tent after a long search. I used it for two and a half months in every weather except snow, and this tent is just terrific! Strong, light, easy to set up, very well ventilated. Marmot got it right on every part of it (except the stakes). Totally recommended! I bought this tent after comparing to a lot of other tents in the same class. I needed a high quality, light and waterproof tent for a two and a half months backpack travel to Europe during summer. 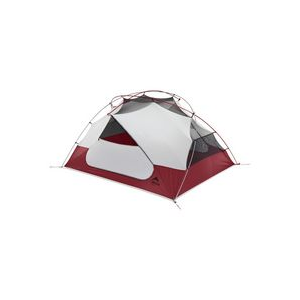 I used this tent many times on different grounds and environments, and I absolutely love this tent! Weighing maximum of 2 kilos, you can't get much lighter than that for the same dimensions and price. I've been to thunderstorms that lasted 3 days, I've been to cold weather, hot rainy weather and high winds, and this tent was perfect in any condition. While raining the tent kept on high ventilation, there were no leaks or condensation, no water getting in from the sides or anything like that. While in hot weather the mesh did its job in keeping the bugs out and the breeze in. On high south winds on the Croatian Islands (called Bura) where most of the tents around me got flat, this tent stood still like a fortress. I had to use every anchoring point it had, but I had no worries for it to be blown away or for the poles to break. In cold rainy weather I experienced cold wind getting into the tent, of course because of the high ventilation. So I think it might not be the best choice if you know you'll be in cold weather most of the time. The building and material quality is superb and I didn't had anything been broken or torn, the fly stood in high tensions and it looked very rough and strong, the poles as well. The footprint and floor overcome stones and twigs, only the stakes got bent too easily and I would definitely recommend to replace them. I got the MSR Groundhog and they had no problem with any kind of ground. 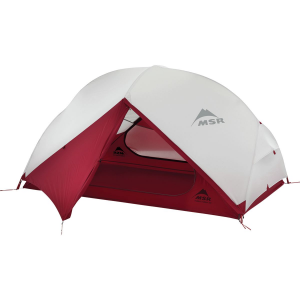 As for space, this tent is larger than most other tents in the same weight and price category. I'm 1.75 meters and thin and I could easily fit with another person and a bag in it. It's very easy to set up, without any complex parts or methods, rain fly fits perfectly and very quickly. Easy to fold back, lots of storage space inside. I'm happy that I chose this tent, and I'm looking forward to use it for a long time. This update is after 4 years of use. I still love this tent and it has been perfect for my needs. The last time I used it I noticed that some water was penetrating through the floor. When I examined it at home I couldn't notice any tear/wear. I contacted Marmot Warranty without too many expectations, to my own surprise Marmot didn't ask me to send the tent for examination, or used the "regular wear" excuse, and just replayed right away to go to the local dealer and replace my 4 years old tent with a brand new one! Even more, I bought it in a different country from where I'm living and the local dealer just helped me right away, no questions asked! Marmot Warranty service is probably the best one out there! Thanks for the long-term update on your tent, Yuvalk. That's great that Marmot customer service was so easy and helpful for you. Enjoy the new tent! Great features and construction, just a little small for two to cohabitate and heavy for one to carry. Quality and design are "well done!" Not light: 6# (not 5) as delivered. I already own a Shires Rainbow Solo tent which weighs 1# but is minimalist in design and made of super UL materials. This is my solo backpacking tent. Additionally, I own a Eureka Juno 3xtA three person tent which weighs in at 6.3# but is palatial in roominess and features to comfortably house a couple of "heterosexual" fishing partners. I use it out of the back of the car or when lakeside camping out of my power boat. The "need" for this tent was for something in between in weight, comfort features and required footprint that would be used as a comfortable and rugged solo tent for kayak/canoe trips in the Northeast. After much research, it came down between Marmot's Earlylight 2P and Limelight 2P. the available hatch/cedar color was "woods stealthy" which I like as i'll often set up camp and then go off fishing. the window is very handy for quickly checking weather, wind conditions etc. the included free loft and ground cloth , while adding weight, add comfort. the ability to set up just the fly and ground cloth is perfect for the occasional shoreside nap. In the end the Limelight won out as its fly had a smaller footprint and the brow pole did add extra volume. I was also a little concerned with the placement of the two windows in the Earlylight as they seemed like they would be right over my eyes while sleeping. All in all, it's a great tent, but I'd be disappointed if I had purchased this to serve as a backpacking tent. It weighs 5.98# as delivered and I havn't even added extra guide lines and stakes yet. Previously I used a Eureka Timberline 2 tent. This tent was good in cold temps, inadequate in warm to hot temps. Also the rain fly was inadequate in wind driven rainstorms. The Marmot Limelight 2 is far superior to the Eureka. The shape and design make it FAR less susceptible to high winds. The Marmot rain fly covers so much better providing more protection/cover and a covered entry. Much more stable and QUIET in high wind. Costs a little more than the Eureka, but WELL worth the extra expense!!! 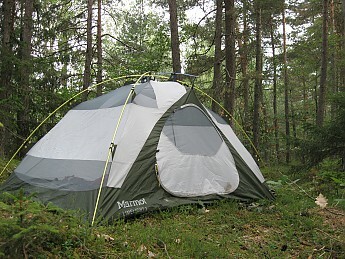 The Marmot 2 is great for 1 person camping. If you need a tent for 2, go for the Marmot 4, you won't be sorry. Original stakes are only fair. Replace them with "groundhog stakes". You'll have a solid tent. If you're a lone backpacker/hiker you may find this tent a little heaver than your liking. I spent a lot of years camping with the Eureka Timberline 2. Also spent a lot of years experiencing its shortcomings. 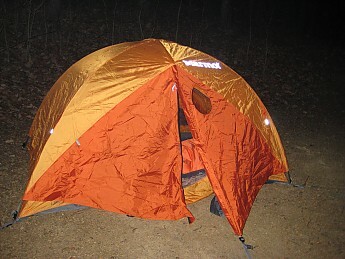 When it wore out I got the Marmot Limelight 2 tent. Man, what a difference, like staying in a Motel 6 compared to a Hilton. Had I known I'd have gotten the Marmot years earlier. The Eureka tent weighs 5 lbs. 13 oz. The Marmot weighs in at 5 lbs. Weight isn't a big factor with me because I travel/camp by motorcycle. Comfort is a BIG factor with me. Because of that I have to add an additional point. Again the Limelight 2 has great ventilation in hot weather. However I also camp in extreme cold weather (20 degrees and below). In these temps, especially with wind, the great ventilation can prove to be somewhat of a disadvantage. To this end I spent an additional $40 on velcro and tent material to make up easily attachable covers to cover the lower vent mesh. With this modification I can say that this Marmot Limelight 2 tent serves me VERY comfortably in 90 degree heat all the way down to 0 degree cold. Man wish I'd come across this tent years ago! PS, Whatever tent you go for, do yourself a favor and get the "groundhog" stakes. When the weather goes bad they'll make the difference between you sleeping through the night or your tent collapsing, getting you up in the middle of the night to deal with it. Quick and easy to set up. Holds up nicely to wind and rain. Came with a free foot print and gear loft. The gear loft seems sort of pointless. I can't remember what I paid but the price was good for the quality of the gear (may have been on sale at Campmor). 1) When unzipping the door from the outside it has a tendency to want to fall to the outside, in the dirt/mud. It's an easy situation to remedy yet it stands in my mind as a point to mention. 2) Zipping the vestibule closed from inside is akin to working yourself into a yoga position. You really have to lean forwards and stretch to get it that last couple of inches. I would not hesitate to recommend this tent to anyone looking for a three season tent. 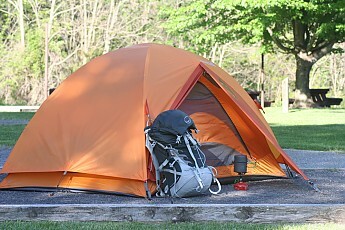 Another note- I use this tent alone; just me and my pack (an external framed Kelty). If the capacity were to be in the plural the fit would be tight. And with two people you definitely would not be bring your packs in. Ease of Setup: Very Simple. And Solid. Weight: just over 5 lbs. Awesome tent. One of my first reviews, and first time out, but very easy to set up and break down. Great clips, and it was just amazing some of the small things they add into tents. That being said, don't think I'm going easy on this review. I didn't have a chance to use it in rain, so I won't act like I was able to. But I did use it for a couple of days in the GA backcountry and it just felt so solid. Front doorway is great getting into, easy to get out. The footprint that is included is great, along with the gear loft! I used the gear loft so much. It's an awesome little bit of extra engineering. Tent feels like a house when staked and guyed out. Doesn't vent absolutely great, but we also didn't have any wind. Like, none at all, it was a bummer. All in all, a solid one person tent with room, for two people. Be ready to say hi to your neighbor, but shouldn't be too bad. I'd share this tent, knowing how excellent it is. Two inside pockets, and the rainfly has a stitched in stick that opens a little in the back like the Stingray model to help for ventilation. In wind I bet body parts it would vent well. Bought this tent new on Ebay in Jan 2018 and after less than one year and a total of about 15-20 nights camping it is now unusable. First the Velcro straps attaching the fly to the poles fell off, then the seam tape at the bottom of the fly began to deteriorate, finally (during rain) water flooded into the tent directly through the ground sheet and bottom part of the fly resulting in me getting soaked. I wouldn’t dare to take out this tent again. Though there is supposedly a lifetime guarantee numerous emails to Marmot have been ignored and the Marmot Distributors I have contacted have all referred me back to Marmot! If you don’t want to wake up in the middle of a rainy night to find your tent flooded with water coming directly through the ground sheet and have Marmot ignore numerous messages then don’t buy this tent!! Very roomy two-person allows for moving around without bumping your head. Quick and easy setup makes for more exploration time. Rain tight, but holds onto moisture. My desire for a new tent has been two years in the making. With an 8 year-old daughter growing like a weed it was finally time. After plenty of research, I just waited for a deal. I found one online at OMC which was also a local company so I stopped by to purchase for 25% off. I was so excited I made a trip down to the Oregon coast to try out the following week. This is a good place to try for a number of reason. Moisture being choice number one. Because there's so much humidity in the air, tents reveal themselves quickly as did this one. Setup went beautifully as I didn't really need any instructions as it was quite self-explanatory to me. This was one of my demands of purchasing a new tent. My others were as follows: footprint included, two doors, ample headroom, storage space including vestibules, zippers that were functional no matter the tautness of the tent, and of course, to keep me dry. Marmot delivered on all accounts except the ventilation. I have to exclude dryness as it hasn't been through a storm yet. It handled what little wind there was fine. Because of the more upright design I can see it being very sturdy even with 20-30mph winds. I really like the footprint shape and how Marmot designed it to set up with the fly only. I haven't tried in this fashion yet, but there will be a time it will be used. Make it easy for stargazing. On this trip, my daughter was not with me, but I can tell you compared to our old tent, there's plenty of room for her and I as we tried it in the store before buying. She's 4'10" at 8 y.o., and I'm 6'1", combined our weights are about 240. The elevated walls is what really make the difference I thought for I have a very long torso and like to sit up without bumping my head. This was beneficial especially with the condensation that built up overnight. On the point, even though there was a mass amount of moisture buildup I will say that I slept the best I've ever had before because I also had a new sleeping pad which seemed to keep me warmer than usual. I suspect that maybe my heat had something to do with that. I was surprised because there's a vent that was open. That being said I actually didn't pack up the tent when I left I just placed in my vehicle to take home to dry. It took a full 48 hours for the moisture to evaporate. This discouraged me a little because one my issues with my last tent was moisture buildup which led to mildew. Not healthy to breathe even when you're outdoors. This is exactly why I did allow it to dry before packing nicely into its handy storage bag. Storable space for my glasses and headlamp was very accessible. Quality of poles, stakes, and fabric are spot on, especially for the price. All said and done, I can't wait to try again, maybe in a different climate to see if the moisture issue was situational. I'm very happy so far though. Thanks for the review, George. I hope you'll keep us posted on how the Limelight continues to work out for you. Fast to set up and take down, with a nice vertical rake to the walls and good headroom and floor space. A good overnighter or budget tent. What you get in convenience and price, you pay for in lbs, however—5.5 pounds. 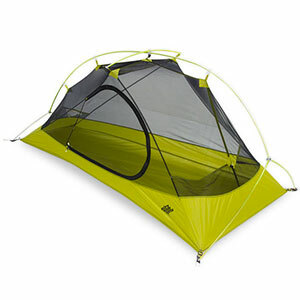 The Marmot Limelight 2 is a roomy, easy setup, two-person tent that has the added advantage of being easy on the wallet. Its weight (a hefty five and a half lbs with ground cloth and rainfly) is its main drawback. Material and construction are of good quality. 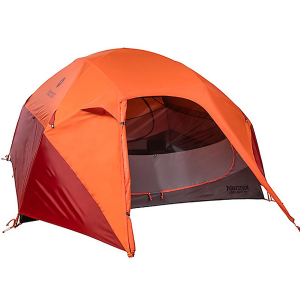 What sets this tent apart at its price point are the near vertical sidewalls which make this tent far more comfortable than other tents with similar square footage. 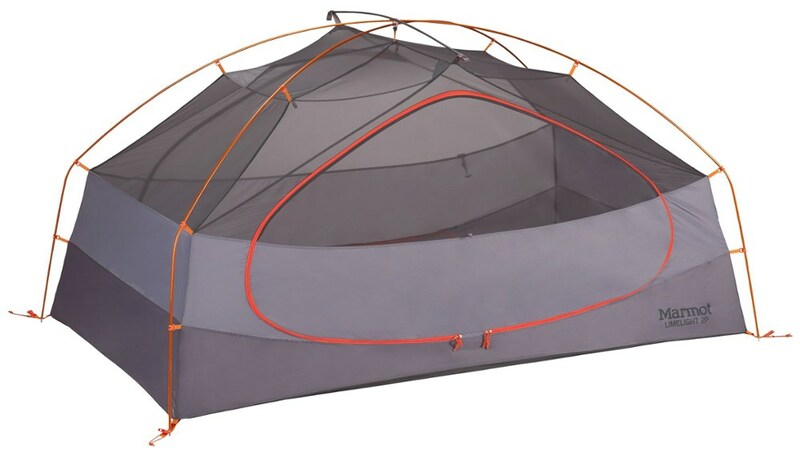 Sleeping with the sidewall inches over your face is not a consideration with this tent. Weighing in at over 5.5 lbs, its heft is this tent's main drawback, limiting use to weekend hikes or car camping. Welcome to Trailspace, Andrew! Thanks for sharing your first gear review with us. I'd love to see some pictures of your Limelight out in the field, if you're willing to share them in your review. Decent solo mountain tent for the sub-alpine. I bought this as a solo summer mountain tent and am happy with what I have. It is perfect for one person. If two men are sharing this tent then they are probably sharing more than a tent. I have not had it in any summer snow conditions (YET), but if you're able to tie it down it should handle a couple of inches, which makes the 5 lb total travel weight reasonable. Thanks for the review, Paul. I agree that "2-man tents" are often a questionable description. Do you have any pics? There are so many good things to say about this tent. This is the first tent that I ever bought for my wife and I and we still use it, even with our 2yr old. However, we are very small people. No matter the condition though, I have never had a problem with this tent except for the zipper entry point on the weather cover. It would be a nice added feature if there was an easier way to secure the flap to the outside of the tent when going in and out, sometimes it gets annoyingly in the way, especially when raining. Despite that minor problem, I would highly recommend this tent to anyone looking for a durable, lightweight and easy/fast set up system. 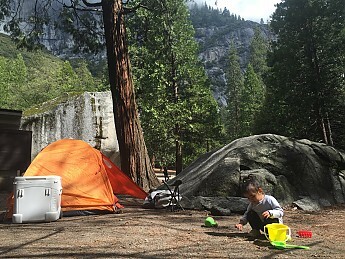 We have used this tent in several different types of conditions, from rain in Yosemite to the deserts of California, I've taken it to the beach as well and still provided great shade and ventilation on a hot day. I own two tents and this is always my go-to tent. Love this tent. It sets up fast and easy. Great for three-season camping and I like the raindrop window on the fly. I have owned it for two years now and it has stood up well. I needed a lighter tent for a backpacking trip and didn't want to lug around an 8 lb tent. This is a very solid choice with a good price point (especially if you can find it on sale). It has great durable rip-stop nylon and doesn't weigh down my backpack. I wouldn't recommend using it for two people unless you want to be extremely close to them and not have your gear in the tent with you, but that true of any 2-person tent. Setup: Very simple and easy. Just took a couple of minutes. Stability: It didn't rain when I used it, but it held up to some fairly strong winds. Ventilation: It is perhaps a bit too ventilated, because when I wasn't in my sleeping bag I was freezing and the walls allowed a lot of wind to come through the vents. Room: Very tight for two people, and even tight for a person with gear, but it serves its purpose and the rain fly can hold gear too. Can be a bit of a pain to get in and out of. Packability: It packs small and is pretty light. Not the lightest on the market, but much lighter than anything else I have and for the stability that it offers it's extremely light. Construction: Very thin rip-stop nylon, should hold up well over time, and poles seemed very solid. Conditions: I hiked in some hills in Eastern Missouri with it and was impressed. It didn't rain during the four day hike, but it got a bit chilly at night. Please explain the difference between tent Limelight "FC" and Limelight without "FC! The external cover is too short!! Excellent performance in 30 days trekking in the south of Chile and other areas. Need to extend the external cover for wind protection. Axel, it looks like the Limelight FC name only comes up with European retailers. The US Marmot info and retailers have no reference to it and stick to Limelight. My guess is that it's a naming convention outside the US to signify the tent has Full Coverage. Best tent for the price. I just spent a week in it in WV with one thunderstorm to test it out. I stayed bone-dry. Also, the easiest tent in the world to set up. I'm going to buy the 3P version also. You will love this tent. 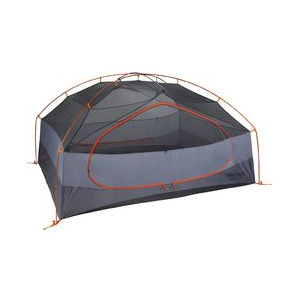 This tent is sturdy and will keep you dry and safe. Lived in this tent with my wife for a month through rainy season in Panama and did not get wet once inside the tent. It is an amazing tent with many good features, packs up super small and weighs little and most importantly can handle the elements. This is a very well designed tent. It has been through some serious rain and wind storms with me and i always stayed dry. i travel alone so for 2 people this tent is small unless it's an adult and child or two smaller people. the little window is very handy, ventilation is excellent, the poles are a dream, they almost put themselves together, the color is nice and bright on dreary, dark days, stakes are first class, zippers are stout, fly is well made and solid. for me bike touring alone, this tent is ideal. I've never been one to crave sleeping outdoors. As an amateur landscape photographer I enjoy hiking, it's just that many of the locales I wish to photograph are more than a day hike from the trailhead, ergo, I use a tent. While I've had the pleasure of borrowing tents for much of my life, the Marmot is the first I've owned myself. I don't think anyone has found the perfect design for erecting a tent, but the system Marmot uses here is a winner. 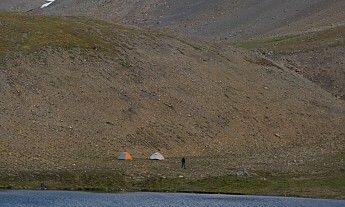 It is possible for one person to set both main poles simultaneously before raising the tent body. I did it once before using the tent and I was comfortable enough to take it into fair weather. Marmot has videos on their site that demonstrate the system quite well. The tent also breathes well. This tent is not a 4-season tent, but as I mentioned in another review I found myself camping in sub-freezing temperatures one night in March. There was remarkably little frost built-up under the fly and on the poles, and there was no noticeable condensation (and no frost at all) on the inside of the inner tent. Don't forget when setting up to open the rear fly vent. They've sewn in a short metal pole and some velcro to open a small gap in the back of the fly. This is what's keeping you dry overnight. If I had my way I wouldn't carry the whole package myself. At 5 pounds it's at the average for 2-man backpacker tents. Over rough terrain that ends up being heavy enough for me to contemplate splitting the load between two people. That's nice for the trail, but it complicates setup and tear down. One can no longer simply roll or unroll the the tent from the stuff sack directly onto the site. That's also another sil-nylon stuff sack, adding $15 or so to the amount invested into the setup. As others have mentioned, the zipper on the rain fly is difficult to reach from inside the tent. I have to kneel on the ground in the vestibule to reach it. This isn't a problem on warm, dry ground, but if you find yourself camping after a bit of rain you may end up tracking some dirt back into the tent. I would also label the included gear loft as mostly useless. You might be able to stow your deck of cards or a small paperback up there, but it isn't useful for the personal items of two tentmates. I really thought the single-door design would be a big drag, but it hasn't been yet. I may just be lucky in that my usual tentmates don't get up in the middle of the night. Your experience may be different, depending on the sleep behavior and/or bladder size of your tentmate. Marmot also advertises the sizable vestibule as a place to stow gear. Here in the Midwest we are typically required to loft our packs onto poles, cables, or into trees as to not attract coyotes and other smaller critters. Other parts of the country have similar requirements for different critters, but the end result is the same. It is still a useful place to keep your footwear. Finally, I should mention that the tent seems to have a versatile guy-out setup, but I have not used it. Don't expect to guy the tent without buying more poles though. There are a couple extra, but not that many. The Limelight is pretty affordable for its feature set. For its small premium over other models you get a full-coverage rain fly, clip-based setup, and an included water-resistant ground cloth. If you were originally considering something like a Eureka Timberline, consider the Marmot Limelight as a better value. Design: Three season freestanding dome. Ease of Setup: Very east to set up, clean up, and take down. Took this tent to Zion NP for its maiden voyage. 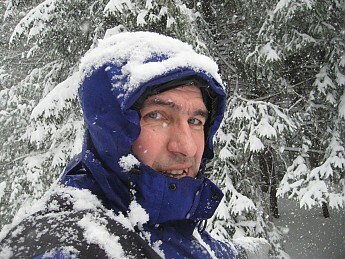 Hiked a twenty mile loop in some dicey conditions (windy and cold). This tent was quite sturdy and kept up warm for the night. It does only have one door so if you have to frequently "step out" for the night, you had better be the one sleeping by the door. Other than that, light weight is a plus, reflective less trip ups at night, with plenty of stash room for odds and ends. Overall a great tent! Would recommend! This should be a helpful comment. I've owned a generation of this Limelight for a few years now. It's been rock climbing in AZ + SoCal, winter camping in lake effect temps and snow and two dozen rain soaked Oregon nights among tons of others. This tent has held up through all of it. If you take care of this tent it'll take care of you - no doubt. Good ventilation in the warmer times, but knocks down drafts in the colder temps. Well designed - very simplistic but has some bells and whistles. The rain fly leaves no exposure of tent walls but the vestibule could have been a little bit bigger. Best part is it packs small and light. nice touch: has a ring on the celing to hang a light via a biner - a backpacker's chandelier if you like. 4.5 stars. I bought this tent due to my old (20+years) Eureka Timberlite had seen better days. After many trips the coating was shot and leaked on the last two trips. I did some research and the Limelight 2 seemed like a good fit for my usage (motorcycle and quad camping). The packed size was not too bad. Setting the tent up is a breeze, nice pole design and clips work great. The vestibule will be a nice addition since the old tent did not have one. The free footprint is good quality and a nice feature without spending extra money. The gear loft is small and also included with the tent. Small items will fit nicely in it and out of the way. The storage pockets are nice but only one can be accessed when laying down since they are on either side of the door but this is a minor issue. I haven't tried it in the rain yet but the taped seams are well done so I don't see the rain being a problem. The floor design should also be very good in wet weather. With a good amount of netting the tent stays fairly cool. The fly has a vent that opens and with a little wind it is noticeable inside the tent. The size for 2 people would be crowded but for one it is very roomy. 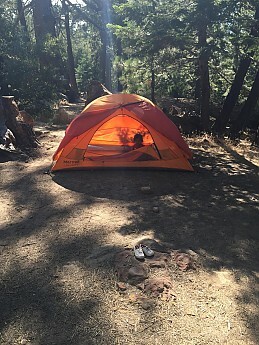 Overall the Limelight 2 is a quality tent for the money. One somewhat irritating point - the fly only fits one way, with no easy 'this goes here' feature. The tent is actually somewhat narrower at one end. Fine, good to reduce pack size / weight, but makes putting some mark on a corner necessary. I got some reflective tape & seam glued 4" of tape to corner of fly and tent body. Otherwise excel, does the job for not that much $$$. Light yet durable and well put together. Easy set up. I used it this weekend in 30+ MPH winds w/ no issues at all. I have not used it in the rain yet but based upon what I have seen so far I don't see any problem in the rain. Came w/ a free footprint which is a $20 average bonus. My only issue: I hate crawling over the zipped down door. I wish Marmot could have made the door w/ a C design like so many others where the door hangs in place when unzipped and you can move it out of your way. My fear is snagging the door climbing in and out of the tent as the majority of it is screen. Awesome tent. Really easy to set up, great ventilation, and very watertight. I slept in this on a very windy night and felt no draft at all. I am 6'3" and can lie down very comfortably without touching either end of the tent. Remember though, this has only one door and vestibule. The Earlylight is basically the same tent but has dual doors and vestibules. Came with a free gear loft and footprint. I actually purchased a Marmot Nyx on E-Bay and they sent me a Limelight by mistake. I'm not upset by the substitution. I'm not able to give a full review, however what I have experienced so far is great; and I haven't even spent a night in it yet! This past weekend I spent a night in my sister's Kelty Grand Mesa tent during a backpack trip on the AT. Not a bad tent, and take down was fairly easy. My Marmot tent didn't arrive until the day after my hike. Just playing around with it today, I was very impressed. I set it up in probably about 4-1/2 minutes, including the fly. My wife crawled in and we found that it would indeed have enough space for two with decent room for gear in the vestibule. All the seams are sealed well, and it included both a gear loft and a footprint! Those two items would have added another $40-$50 to the Nyx. The quality appears to be top-notch and it packs down to 6"x18" with a packed weight of about 4-3/4 pounds. I can also use just the footprint and fly and keep the weight to just a few ticks above 2 pounds. I hope to submit a more complete review in the near future, but I probably won't get out on the trail for at least a month or so. I guess I'll at least set it up in my yard and sleep out in a heavy overnight rainstorm. But I'm confident that this tent will fit my needs perfectly! As I had stated a few months ago, I wanted to submit a more thorough review on this tent. This puppy rocks! In short, this thing has taken everything I've thrown at it. Every once in a while, you buy something and you say, "Boy that's the best $100 bucks I spent in a long time." Well, in my humble opinion the Marmot Limelight fits that description. It does everything I could ask of it and more. No, it's not a true four-season tent (I'm still considering one), but I'm truly impressed with it! You could do far worse than the Limelight, but probably not any better for the money. And that's what I call a great value. Great tent for the money. I have yet to use it on a backpacking trip and would probably just go with the fly and footprint to save weight and bulk. Have used it several times for car camping with great success. Handles strong wind well and absolutely no condensation was present due to the great ventilation. If it packed down smaller I would give it 5 stars but this can easily be worked around by sharing the gear among your fellow backpackers. The tent is made very well for rain, this is why I bought it. This tent weighs 6.2lbs. not 5lbs. like it states. Hiking 14,000 foot peaks means weight is an issue. I am disappointed that I may have to purchase a new tent over 1.2 lbs but that is another thing that I was looking for. They should not mislead the customer into purchasing this tent. IF WEIGHT IS AN ISSUE DON'T BUY THIS TENT.